Malnutrition has long been linked to the death of half of the population of children under five years of age. A global concern for decades, malnutrition is mostly a result of poverty, rampant diseases, natural disasters, and ongoing conflicts. It has caused severe lifetime effects on children, such as the failure to control their cognitive skills and achieve their full possible height and weight. 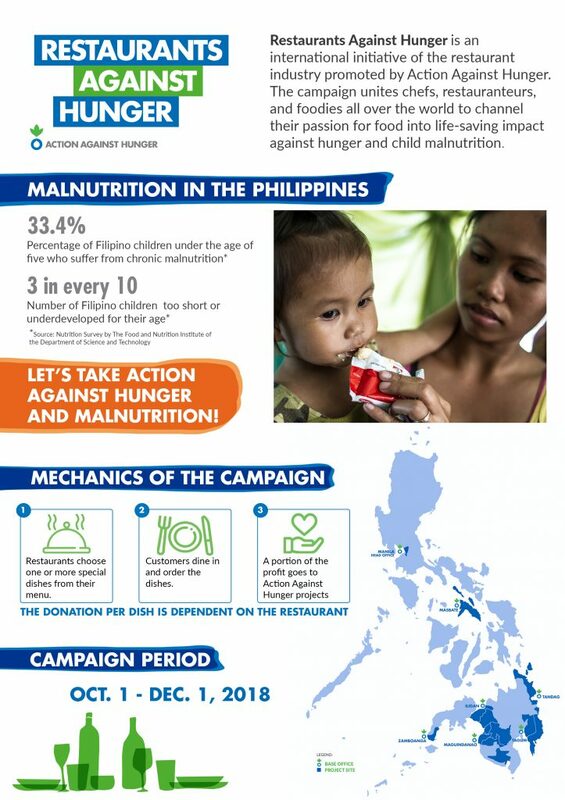 In the Philippines, one out of three children suffers from malnutrition. The country even ranked 9th globally with the highest number of children who are stunted or too short for their age. According to the Food and Nutrition Research Institute, 26 percent of children up to two years old suffer from chronic malnutrition, the highest number in 10 years. 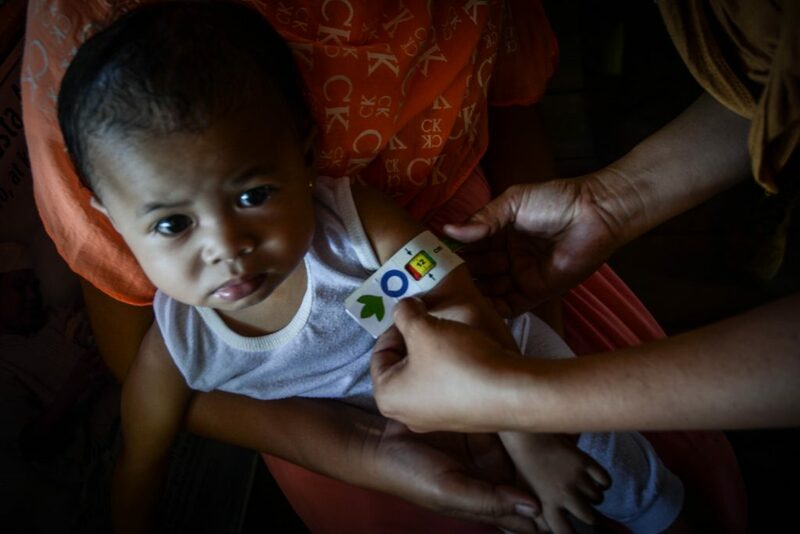 A child is screened for malnutrition in Barangay Ilaya, in the municipality of Sara, province of Iloilo. A study by Inter-Agency Regional Analyst Network and Action Against Hunger showed that by 2030, the disturbing number of malnutrition cases is expected to have worsened. Take note that this study was done in 2016, when the state of economy was still bearable, even for poor families. If this was done under the Philippines’ current economic climate where basic necessities have further become inaccessible, the results would have hit the skids. To be fair, many local organizations addressing this issue have made progress in raising awareness, most especially in calling the attention of local government units to support campaigns against malnutrition. However, with the inconsistent decrease in the country’s malnutrition statistics since 1998, there is still a lot left to do. A volunteer measures the mid-upper arm of a child to determine malnourishment. This is why we should engage in the efforts of organizations, may it be governmental or non-governmental, in not just feeding but addressing the medical concerns of the affected people. Furthermore, as stated in the campaign of Action Against Hunger, a humanitarian organization that has crossed over 50 countries, we should likewise seek the root cause of malnutrition and start there. “We do not just want to provide medical treatment but also help families and communities address the fundamental cause that led to this,” said Dale Divinagracia, manager of the campaign’s fundraising and resource development. As of writing, 28 restaurants have signed up. Although the campaign began in other parts of the world in 1998, this is just their third run in the Philippines. The organizers aim to earn P2 million within the campaign’s two-month run from Oct. 1 to Dec. 1, so if you happen to be a restaurant owner, you can still sign your restaurant, eatery, or café up! This is also open to online sellers of food and goodies. In the previous years, Restaurants Against Hunger has helped fund the nutrition screening and food distribution to areas affected by calamity and conflict. During the Marawi siege last year, the campaign was able to respond to the needs of more than 200,000 affected individuals. It was also able to conduct hygiene promotion sessions and establish clean tap stands and toilets for those in the areas of Masbate, North Cotabato, and Maguindanao. Now how can we, diners, help in the campaign? The participating food establishments will choose specific dishes that can “feed more people,” as its proceeds go directly to the project. All we have to do is go to a participating restaurant where the official campaign poster (shown above) or a tabletop (below) can be seen, order the dishes they pledged to the campaign, and eat. Even an action as simple as dining can help multiple people. 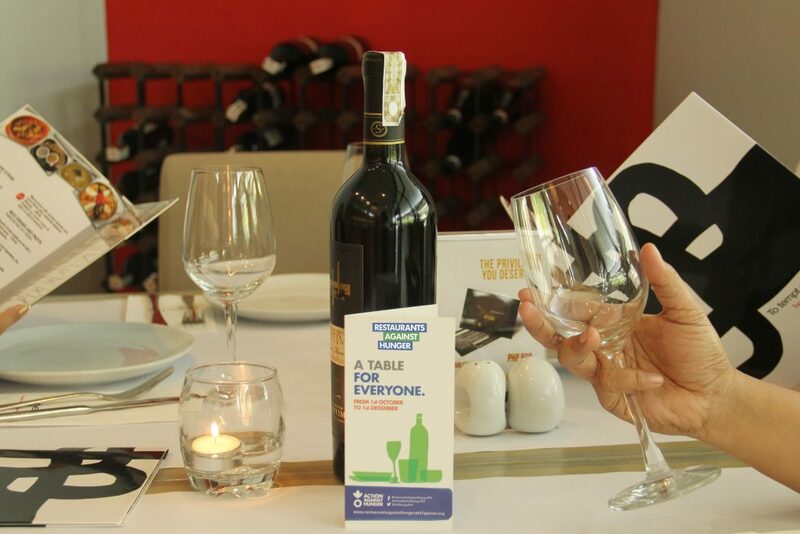 This tabletop signifies that the restaurant has pledged some of its dishes to the campaign. Photos and infographic courtesy of Action Against Hunger.